On Monday, 5th November, the Ambassador of Switzerland, H.E. 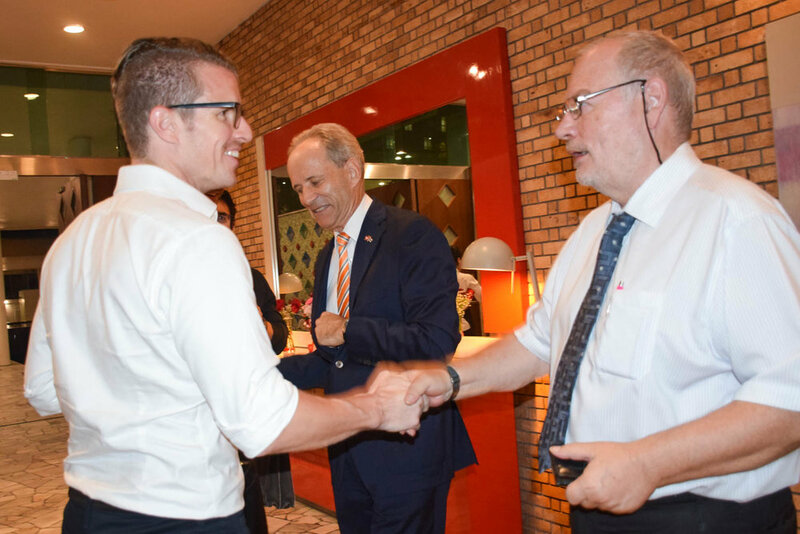 Ivo Sieber and the President of the STCC, Bruno G. Odermatt, invited members of the STCC, distinguished guests from the Joint Foreign Chambers of Commerce, Foreign Chambers, Board of Trade, Board of Investment, Thai Bankers Association, Swiss Students Alumni Association, Swiss Society Bangkok, Swiss School Bangkok, friends and supporters of the STCC, to join a spectacular night at the residence of the Swiss Ambassador. Close to 160 people showed up at a cool November evening and the weather was just perfect for this festive occasion. A number of Presidents and colleagues of the Foreign Chambers presented flowers and well wishes to the 20th birthday of our Chamber. They encouraged the STCC to continue its success story. 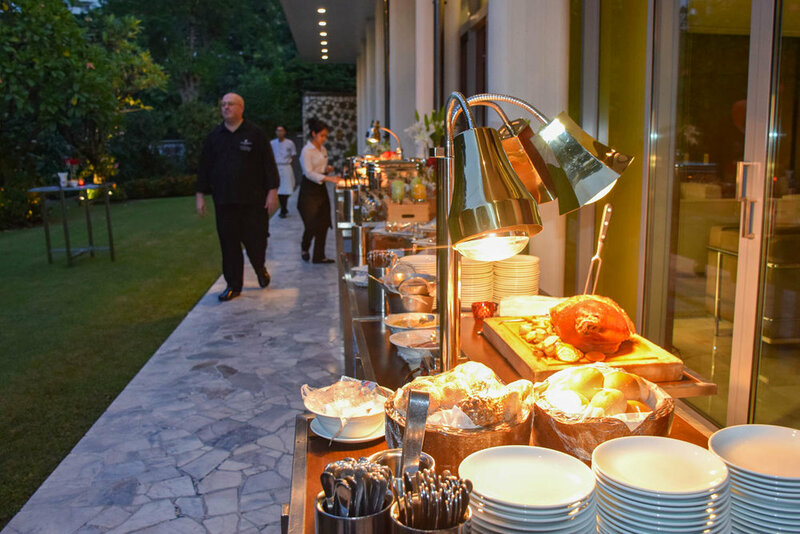 All the guests were treated to a delicious buffet, including 2 Raclette stations, and selected wines from one of the finest Swiss regions. 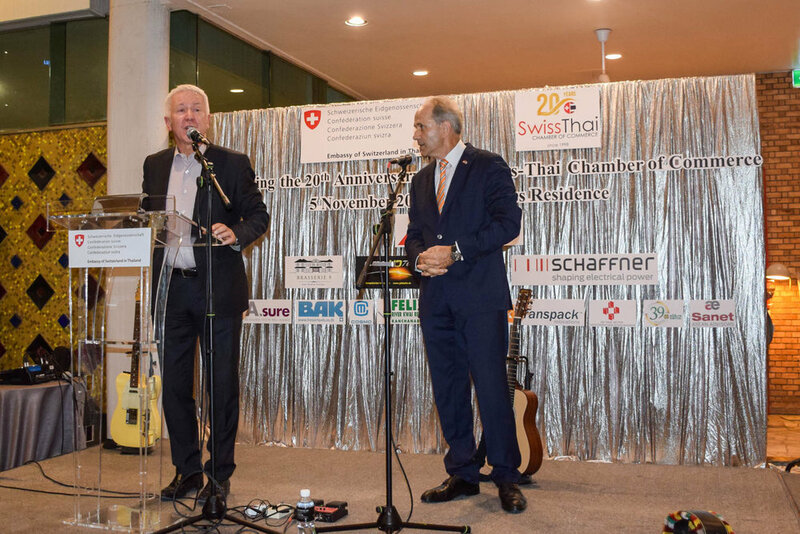 The highlight of the evening was the performance of Veronica Fusaro, a highly talented singer from Switzerland, who stopped over in Bangkok on her way to performances scheduled in Australia and New Zealand. Her spectacular voice and impressive solo performance was just outstanding and we hope to see this promising star back in Bangkok in the future. Thank you for your wonderful performance, Veronica! We were also privileged to have the founding father of our Chamber, Paul Somm and his charming wife Milly Somm, with us. Paul was the driving force behind the establishment of our Chamber in 1998. 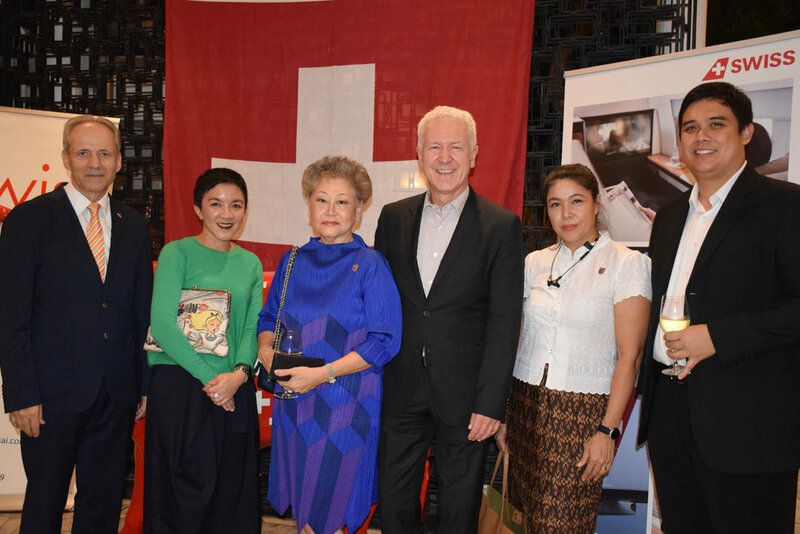 He and a small group of visionary Swiss/Thai business people and entrepreneurs wanted to build closer business and trading relationships between Thailand and Switzerland. After 20 years we can attest that they succeeded in their endeavor. Paul was the first STCC President from 1998 to 2001 and he laid the foundation for our success story. In recognition for his outstanding contributions to the Chamber, the STCC President, on behalf of the Board of Directors, presented Paul with a memorable token of appreciation. The Ambassador was delighted to present a bouquet of flowers to Milly Somm, who also played an important part in supporting Paul in building up the Chamber. We wish both of them good health, a peaceful retirement and many more memorable moments at their place in Pranburi. Thank you Paul and Milly for what you have done for the Chamber and the Thai/Swiss business community. It is truly appreciated. It was definitely a night to be remembered and we also extend our gratitude to H.E. Ambassador Ivo Sieber and his support team, who worked tirelessly behind the scenes to make this a truly memorable evening. Newer Post20th Anniversary STCC Donation to Moo Baan Dek.